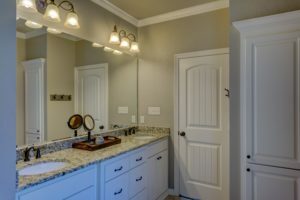 This article is about updating bathrooms, with information about less expensive choices that give you nearly the same look as more expensive bathroom fixtures & flooring. 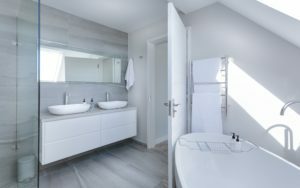 Perhaps you are considering updating a bathroom from what the home builder installed years ago. 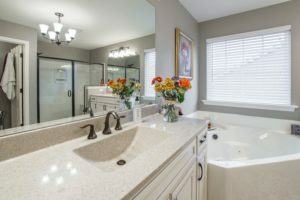 Home builders typically select “neutral” bath fixtures that go with any decor. Their “one size fits all” approach looks ok, but lacks anything considered to be a stylish today. Mirrors Are A High Profile Item When Entering A Bathroom (because they are at eye level). Often, Today’s Bathrooms Have Frame Mirrors. Updating a bathroom often requires a new bath vanity & top. Most older bath vanity tops are one-piece cultured marble, or a laminate counter top with drop-in porcelain bowls. Updating a bathroom vanity & top can be an expensive undertaking. 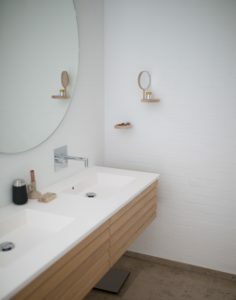 You can lower the cost notably with a, acrylic, solid surface vanity top. Styles are offered that look much the same as granite with porcelain bowl(s) — and about 1/3 less expensive. Al’s Sells & Installs Faucets. Or Buy A Faucet, Bring It Home, And Al’s Can Install It For You. Do you love the look of granite vanity top with porcelain bowls, but can’t justify the cost? 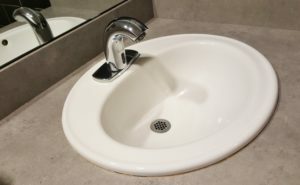 The solid surface, acrylic vanity tops are around 1/3 less expensive than the granite & porcelain top, and they look nearly identical. The longer the top you need, the more savings you can achieve by buying solid surface. Just below we have links to: 1. Granite & porcelain & 2. Solid surface, acrylic. Solid surface means color runs all the way through and will not wear away. Most are not harmed by acetone nail-polish removers, hot curling irons, makeup or hair dye. Today, Vanity Tops Come In A Variety Of Bowl Styles. Updating A Bathroom With Solid Surface Vanity Tops Offers A Variety Of Bowl Styles. We provided links above to the most common bowl style above. Below are links to different bowl styles & colors. 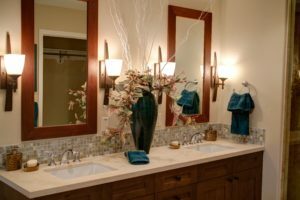 You are not limited to buying a vanity top & base separately when updating a bathroom. 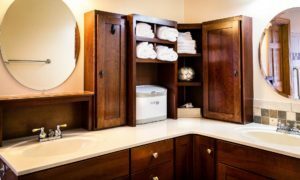 If you wish to keep your existing vanity, all you need is a new vanity top. If you are wanting a whole new look, or feel the existing vanity-base won’t go with the look you are wanting, buy a top & base package. This also allows you to select combinations that the manufacturer likely had interior-designers help create. Depending on its age, a bathtub’s finish is worn out if it does not shine when just cleaned. Does this mean you should replace it? Not necessarily. If there is a shower head over the bathtub, chances are you have a shower curtain closed all of the time so it can dry out between showers. This Job Is Best Left To Professionals. A DIY effort exposes you to toxic gasses. If the prep-work is not done correctly, the new finish will peel. Hire a company that specializes in bathtub & tile refinishing. Updating a bathroom with bathtub and / or ceramic tile refinishing is less expensive and can be done in one day. The existing tub & tile don’t have to be white, you can also update out of date colors. They will repair chipped bathtub porcelain and chipped ceramic tiles as part of the refinishing. In many cases, there is nothing wrong with the existing bathtub or ceramic tile that prevents it from being a candidate for refinishing. Refinished ceramic tile no longer has exposed grout. All the problems associated with grout (cleaning, mildew, staining & falling out) no longer exist. Retrofit Shower-Spa Faucets Require NO Alterations To Existing Plumbing! This product connects to where the shower head was. Your existing faucet handle(s) continue to be used. SHOWN: Stainless Steel Finish — Matches Brushed Nickle Hardware. There Are Several Styles To Choose From. SHOWN: Mirror-Finish Tempered Glass — Matches Chrome Hardware. There Are Several Styles To Choose From. Perhaps you have seen the ceramic 12″ x 24″ tiles used in today’s bathrooms. You can get nearly the same look with Floating Vinyl-Tile Flooring. These tiles stick to each other, not to the floor. Updating a bathroom floor with TrafficMaster brand vinyl tile is much less expensive than with ceramic tile. TrafficMaster vinyl tile does not require any glue or adhesive, plus it’s floating floor (not stuck to the floor below). TrafficMaster can be installed over existing; concrete, wood, vinyl, linoleum and ceramic tile. ** Traffic Master also comes in wood plank styles & colors. What appears as grout lines in the photos are actually beveled edges. Once installed, it appears there is grout between the tiles. You get the look of ceramic tile for a fraction of the price, and without the cleaning required for ceramic, grouted flooring. It’s also a lot warmer in winter. This article was about updating a bathroom. Al’s Plumbing, Heating & A/C, in Plano Texas, provides full service plumbing maintenance, repairs and replacements for every plumbing component in your home. Al’s sells and installs Rheem Professional Series gas & electric water heaters, and tankless water heaters. Al’s Plumbing, Heating & A/C is near your home in Wylie, Murphy, & Rowlette Texas. We service all homes in southern Collin and Denton Counties with no additional travel charge.